Are you leaving money on the table as a blogger? 8 Ways you are! Do you always wonder why you are not making money blogging? Or as some say “my blog doesn’t make money”. Well, I can go on talking about this topic of monetisation – but for a quick and effective start grab my freebie. And, I would like to point out two cases! There are some bloggers who don’t know how to monetise their blog – for them, I am sure my freebie will certainly help. There are other bloggers who try out various money making methods, but still struggle to make ends meet. For either kind, I would like to tell this – you are most likely leaving money on the table. There are SO many wasted opportunities that you either don’t know about, or you don’t care to implement. In this post, I am going to point out some of those so you can fix them and STOP leaving money on the table. OK. By now you should be very well aware of the importance of email marketing. Not everyone may have accounts on social media sites, but everyone I meet do have an email address. Even those who are not actively using the internet have an email address. Email marketing is something you should not ignore if you are an online marketer. So how do you send people emails? You should first have their email address right? So how do you get them? When people visit your website you could entice them with a useful, tempting offer or a promise in return for their email address (and then not forget to deliver that promise or the offer – very important). 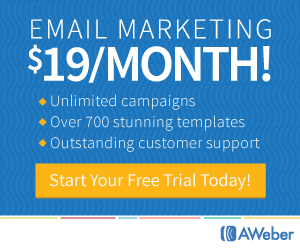 Aweber vs Mailchimp: Which is the best email marketing software? Monetizing a blog without having any product or service is highly challenging (apart from affiliate marketing). If you don’t do affiliate marketing, you should consider releasing one or more products or offer services. Without these, if you totally rely on earnings from ads, it is going to be tough. For one, third party ads don’t help you make much money – and if you need to make a lot of money you need to be getting a lot of traffic to your website. Second, third party ads don’t help much with branding your website/business in the long run. People click your ads, you make money (mind you – you need to get LOTS of traffic for this simple sentence to take meaning). But then, they go away from your website. They are not going to remember you, connect with you or make use of your products. So technically, you are sending people away from your website and your business, just to make a few cents or if you are lucky a few dollars. Now, I hear you! Placing ads on a website is the easiest way to make money on autopilot. You don’t have to work hours to get your product out there! I am not ruling out the option of placing ads on your website – you surely can enjoy the perks of an automated income stream! But without offering a product or a service you are certainly leaving money on the table. Think about this – in a third party ad, you work hard to get that one click and once that happens you send away your prospects! But when you have your own product or service, you do the same work, get that first deal, and make that connection – think about all the future products and services you can offer to that single client? Monetizing a blog is a phrase that I hesitate a lot to use. But I use it anyway because it is so common – people understand it easily that way. However, in fact, there is no such thing as monetising a blog – You don’t monetise a blog, you only monetise a business. Be it your product or services, or affiliate marketing, or ads – it is your business that makes money. And your blog should act as a tool to make that happen. So there is no point in starting a blog out of the blue and then scratching your head on monetisation methods. You don’t just open a shop, and then think about what you would sell there. You first decide what you are going to sell and then open a shop accordingly, furnish it and purchase the necessary material. This is how it works with a blog too. You should have a business plan, which should incorporate a monetisation plan well before you start a blog. If you are already writing and publishing blog posts and yet if you don’t have a monetisation strategy, you are leaving a lot of money on the table I tell you. Pick up my free e-book and start working on it! Let me tell you something you already know. Your blog needs great quality content. And content is the backbone of a blog. I know you get that “duh!” feeling when you read those lines. But have you implemented that advice? Are you publishing great quality content on your blog? Or are you publishing something every week just because your competitor publishes one blog post a week and so you think you have to keep up with that trend? Are you publishing for the sake of it? If so, you have to stop right now! Mediocre or poor quality blog posts will NOT help grow your business. The internet is overloaded with content, some of which are super high quality epic content, in almost every niche under the sun. And if you take your business seriously, you will have to keep up with your standards. By publishing low quality content, you are simply wasting money (on content, and running your business) and as well as leaving money on the table. If you want help with creating great content for your website, here – grab my content creation course that will teach you how to create great content! Did you ever think about getting enough eyeballs to the content you create? Without letting people know about your content and without giving others a chance to take a look at your content, there is no use in creating lots of content. There is also no use in perfecting your website colours and fonts. You are leaving a lot of money on table that way because all your efforts (along with the time and money spent) go unnoticed. Only if people are aware about your work, they will be able to make use of it. It is only then they will be able to do business with you. If you silently run a business by caving in and creating content, you are pitifully wasting your time! So go on and do promotions – don’t feel shy! You should reach out to other bloggers and start pitching guest posts. Also, you should be leaving thoughtful comments on other blogs. Keep yourself active on one to three social media platforms and be helpful. But don’t spread yourself too thin. Pick a handful of methods and stick to them until you see massive results. You know about “putting all your eggs in one basket”, right? Many bloggers experience the hit when their website gets slapped due to a search engine algorithm update. It’s pathetic to think that the success of most online business are generously handed over to Google. Only Google decides whether a website can be successful or not. Is this the mistake of Google? Absolutely no! Google is just doing its job – it is just making its product better and making its customers happy. Why should you allow your business to rely on someone else’s decisions? The Google algorithm was just one example. Anything can happen overnight – and if your business relies only on one income stream your risk is pretty high. So find more than one income stream and build all of them strong enough to sustain. Also don’t be shy to try out new income streams. Some might work while some might not. This is a crucial aspect of any business. In fact, as an entrepreneur you might absolutely have this trait. You cannot blindly go on doing stuff without knowing what works and what doesn’t. If you do so, you will be wasting a lot of time and effort on your business – all for nothing. Which is why, as an entrepreneur, you should absolutely be very cautious about how you spend your time and money. You should only be putting your efforts (time, and money) only on stuff that works. And to do so, you will need to know what works. Whenever you try something new, or whatever strategies you are following, you should keep tabs on the results and the ROI. You should be tracking the results as closely as you can! When you know that something works as you expected, you should be doing more of it. And if you come to know that something isn’t working, you should stop wasting your time and money on that particular strategy! I am adding this as the last item – but you probably know its importance, right? The price of your product or service is highly crucial and it clearly decides how much profit you are making. At the same time, it is not easy to price your product – there are various courses purely dedicated to teach you how to price your product. That shows how important it is and how it is not a trivial thing! So if you do it wrong, you will be leaving a lot of money on the table. Pricing your product (or service) too low will lead to loss. And pricing it too high will create a bad wave. So you have to be very cautious. This might take some practice. But you have to be very careful! Stop leaving money on the table, right now! With blogging, making money is challenging for many bloggers. Many bloggers don’t have a clear thought about the monetisation strategies of their business. I would like to point out here that you need to have a business model in order to make money – merely having a blog, where you publish a few blog posts won’t help you make money. I highly recommend you to pick up my free e-book, if you don’t have clarity on this. Even so, knowingly or unknowingly you could be leaving a lot of money on the table due to ineffective strategies. This post hopefully will help you identify those areas! Wonderful list of reasons why bloggers could be leaving money on the table. Love this post. Building multiple income streams is an absolute must from a business standpoint, I think. You just can’t rely on one source of income and hope to make a living from blogging. Thankfully, I think I tick most of the boxes in your post, however, I must admit, I’ve not paid much attention to guest posting on other blogs as I did in the past with my previous blog. That’s something I need to work on in 2018 to help increase awareness about my brand. Creating your own products is very exciting and can be very profitable too. Great tips and I totally agree with you, it’s so easy to focus on one traffic stream and hope and pray that it makes money. I actually started monetizing my blog with Adsense, which is how most people do. I’ve removed it because like you said, it takes a lot of traffic to earn any money from ads. Right now I am focusing on creating another product. I enjoy creating products because it’s a great monetization model to use for your blog along with affiliate marketing and other income streams. The cool thing about creating products is that you get to keep 100% of the profits. Thanks for sharing these tips and hopefully it will help people realize how important it is to monetize their blog the right way.